Sexual Orientation: She's totally straight! 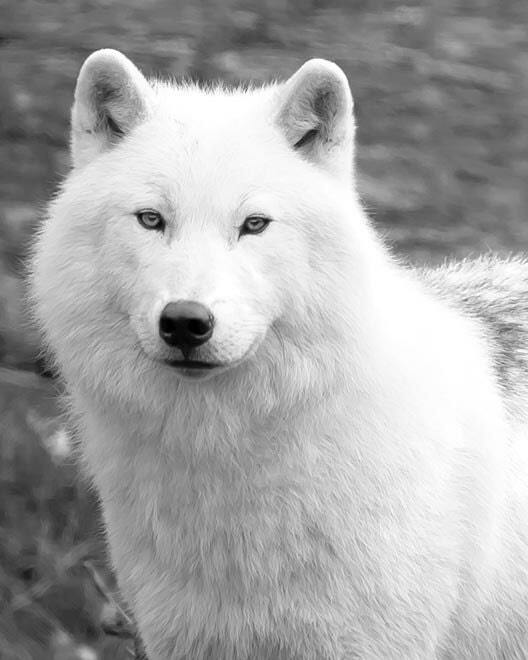 Appearance: Spirit has a think coat, like most Arctic Wolves. Her coat is also white, and she has icy blue eyes. She is not a superstar model or anything so you don’t have to stare at her like she’s walking down the catwalk. Spirit has a long tail with a black tip. Her claws are sharp, and so are her teeth. Her legs are long and she holds her head high. The tips of her ears are also black. She has great hearing and her reflexes are quick. Her howl is loud. She also has a great sight, that’s why she’s a good gatherer. Personality: Spirit is a very calm wolf. She cares for her pack and hates bloodshed. She tries her best to help her pack mates and family, and she will give all her food to another wolf to help them. She will defend her pack and try her best to find food. If a medic needs a herb, Spirit will run of to find it. All the medic needs to do is tell Spirit what the herb looks like. Although, she knows what and where to find rosemary. If she senses danger, she will warn the others. You can count on Spirit! She is very kind and will do whatever she has to do. She loves her family and is a great hunter. If you’re in trouble, Spirit will help. She has a good heart and there’s hope in her eyes. She will always follow directions. She knows North, South, West and East like any wolf and doesn’t get them mixed up. She’ll look everywhere for food and she won’t waste a minute. She will help other wolves by fighting. She loves hunting and her favorite food is fish. Spirit also loves running. So remember, Spirit is the one!